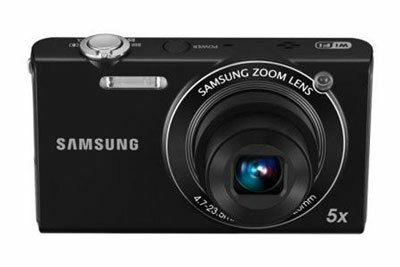 The Samsung SH100 isn’t the first digital camera with built-in Wi-Fi networking, but it breaks new ground by providing zoom, shooting mode and shutter control via a downloadable Android cell phone app. You even get a live picture preview right on the cell phone screen. Trying to set up a group portrait? Join your friends and family, line up the shot on your phone and click the shutter remotely. There are additional Wi-Fi innovations here too. You can automatically back up the photos you take to your PC over the wireless network. The built-in GPS in your Android phone can be used to geotag photos with location information. And if your TV or a device connected to your TV (a Bluetooth player or game console, for example) supports DLNA media networking, you can view your photos on the big screen wirelessly from the camera. As with past Wi-Fi cameras, you can upload photos to online sharing sites, including Picasa, Photo Bucket and Facebook, directly from the SH100. And Samsung offers a free subscription to the Boingo wireless hotspot network, making it possible to upload photos while traveling using one of the 200,000 Boingo-affiliated hotspots worldwide. As for photo basics, the SH100 offers 14.2-megapixel resolution with a 5x zoom lens (26-130mm equivalent), and boasts a 3-inch LCD screen. 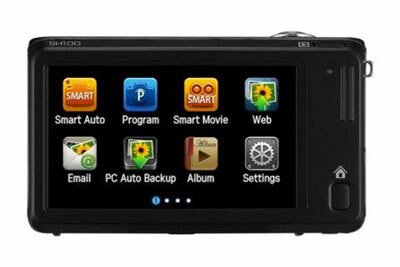 The SH100 is due in March at a reasonable $199.99.